Stainless Steel baked vitreous enamel is reputed for it’s durability. Used on solid fueled ovens, campware and cooking utensils. Now with NEW modern durable ceramic printer and inks, we offer you a full colour image or plaque. Strong as steel with images into baked enamel that will keep the memories of loved ones Forever Shining. The benefits of using this product for your memorial are numerous. Almost indestructible even when this product is mounted externally, the life long corrosion protection of the enamel and the high corrosion resistance of the Stainless Steel back plate will keep your memorial looking like new for many lifetimes to come. It is longer lasting when exposed to sunlight than any other coloured metal and it is graffiti resistant and stain proof as the enamel will not easily scratch and no solvent used to remove painted vandalism can damage its surface. There are also far more applications of vitreous enamel than just memorial products. These include but are not limited to interior and exterior architectural elements as the plates can be made to any dimension and colour. Contact us if you need an overlay for existing memorials. we provide a FREE quote and mock up of your image and also help with attached to your monument. 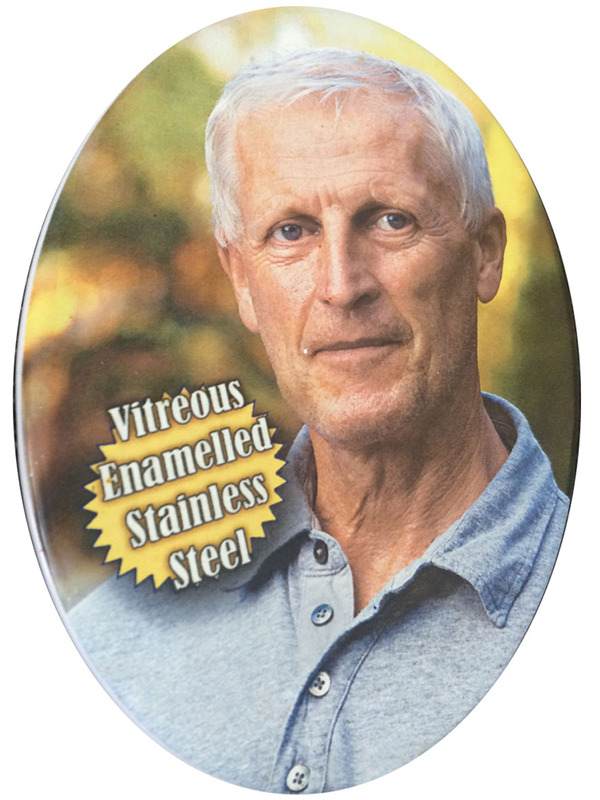 Because of its durability, all Vitreous enamel products have a lifetime guarantee that the enamel applied to the Stainless Steel plate will never peel off. In addition to this, the precision laser-cut Stainless Steel itself has a life long protection against corrosion. Vitreous Enamel, otherwise known in the US as porcelain enamel, is a contemporary method of enamelling which consists of powdered glass being fused to stainless steel plate by firing in a kiln at high temperatures – anywhere up to 850 degrees Celsius. Once baked, the powder melts then hardens to form a uniform, heavy-duty coating which is permanently bonded to the stainless steel substrate. There are up to three layers in a printed vitreous enamel plate, which are all subjected to high temperatures. The first layer bonded to the plate is a ground or undercoat which when baked, permanently fixes the glass onto the metal; Secondly, a cover coat spray is added which may include colour; And finally, any amount of screen-printed graphics which may include text, motifs and photographs are baked onto the cover coat, which concludes the enamelling process. The screen-printing stage facilitates fine detail in all images and text you wish to have on your memorial. The first occurrence of enamel being used to apply pigment to a metal substrate surfaced circa 4300 years ago. This process was used to adorn many Ancient Egyptian artefacts made to honour their Gods and Pharaohs of their day. Today we can see the lasting effects of the enamelling process that has kept these artefacts looking as colourful and glossy as they were when originally crafted all those millennia ago. Should you wish to have some text added to your overlay, please contact us directly by email or on 1300 851 181. Addition of text to an overlay will incur graphic design charges which will depend on the complexity and time involved.